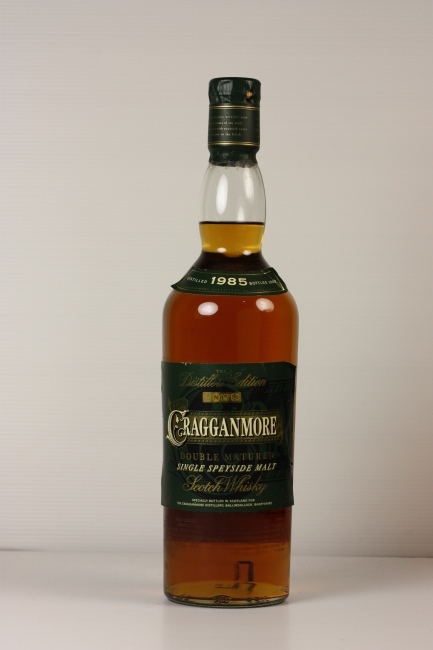 Distilled in the year 1985 and bottled in 2000 Cragganmore was double matured having been finished in ruby port pipes. It is a Speyside malt whisky from Ballindalloch using mineral rich water for the distilling process. This Cragganmore single malt was distilled in 1985 and bottled 15 years later in the year 2000 and was double matured being finished in ruby port pipes. Cragganmore is a Speyside malt whisky from Ballindalloch and uses mineral rich water for the distilling process from a tributary of the River Spey called Craggan Burn. The distillery itself is named after a local landmark Craggan Mor (Big Rock in Gaelic). Cragganmore whiskies are particularly rich and full of character, partly due to the local water but also as a result of its unique stills which are shorter than is the norm in Scotland and which have flat tops which are claimed have a significant effect on the resulting spirit. This double matured single malt will definitely be valued both by collectors and the avid fan alike and it would also make a wonderful gift for a whisky lover.